A victim of the increasing movement towards populism, Brazil ended a ten day truckers strike last week, promising to implement reform to the nation’s national oil and natural gas company, Petrobras. The changes are wide-ranging and swift, starting with the ouster of Petrobras’ president, Pedro Parente. Other reforms included the resubsidization of oil to Brazilians, and a change to policy regarding the adjustment of gas prices. The changes, while important to the livelihoods of Brazilians, are indicative of frustration with Brazil’s consistently corrupt government and Brazil’s struggles to fit into the world economy. Petrobras has been marred by accusations of it being a process for political grafting. Multiple Brazilian Presidents, including current President Michel Temer, have been named in allegations of Petrobras corruption. The strike began with action by members of Brazil’s energy and trucking sectors. 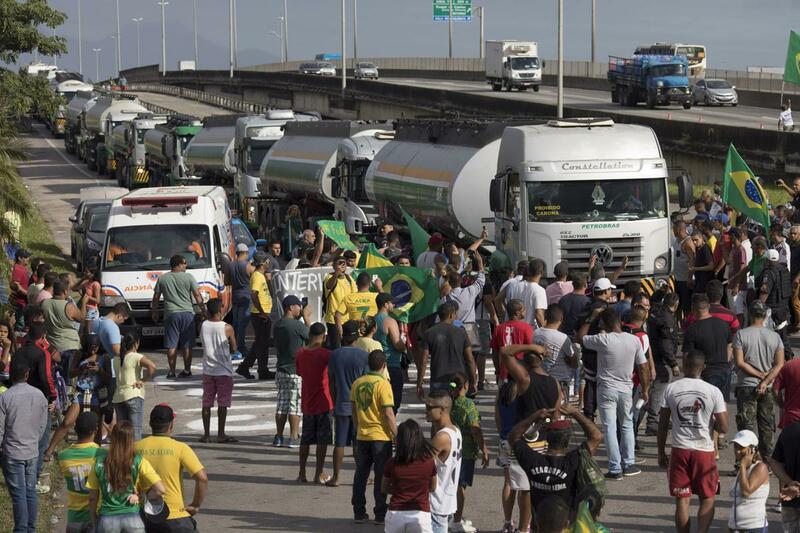 Activity at eight of Petrobras’ rigs ground to a halt, and truckers formed blockades on roads, parking their trucks in the middle of highways. Energy workers, angry about corruption under President Temer, and truckers, upset about rising oil prices brought on by Temer’s free-marketreforms, united to force the Brazilian economy to a standstill. All sectors of the Brazilian economy stopped, with schools being closed, shops running dry, transportation halted, and farming and meatpacking groups losing hundreds of millions of dollars worth of goods. Public transportation was closed, and public services and subsidized The strike was only resolved when Temer promised to subsidize gasoline 12% for sixty days, at the cost of approximately $2.5 billion USD. He also promised to adjust the price of oil monthly, in contrast to the previous policy of daily readjustments to respond to market behavior. This is bad news for an already struggling Brazilian economy. The state saw stagnant growth last year, only rising at a rate of 1 percent, and recently has dealt with inflation, with the real falling to a quarter of the US dollar. Petrobras stock fell 36 percent to less than $10 USD per share, the first time since 2015 it reached that level. Energy reform costs will have to come out of the public’s pocket, however. President Temer has tried to court international investors and therefore acknowledged that Petrobras subsidies would come from healthcare and education funds. This is a key part of Brazilian strategy; to keep up foreign investment, like the purchase of an electricity group being bought for more than $1 billion USD last week, Temer must tout free market reforms. This has angered normal Brazilians, who were faced with the confluence of corruption, a stammering top-down economy, and the results of a strike that froze the country. For some, there is no win; to resolve the strike and return to normal activity, Brazil must hurt their own people’s livelihood and continue a system that pays its profits to corrupt entities, not their workers. Polling about the strike has been wildly erratic. The Globo polling firm has found that only 45 percent of Brazilians support the strike, while 95 percent blame the Temer administration for poor handling of the situation, while the Datafolha group found that 87 percent of Brazilians were in favor of action with over half supporting continued standstills. Although the numbers are muddy, it is clear discontent is high; although only 10 percent of truckers belong to a union, protests were widespread, and the public also got involved in the shutdown of Brazil. This sort of widespread political unrest is resonant of the waves of populism that brought Donald Trump to the US Presidency, and the political situation is much the same. Temer, a traditional free-market conservative, has faced anger since his narrow escape from impeachment proceedings from corruption in a different Petrobras scandal. His predecessor, the liberal Dilma Rousseff, was herself impeached on Petrobras corruption charges. Recent polling has shown support for Jair Bolsonaro, the right-wing populist former army captain. This comes on the heels of surveys by IPSOS Global showing that 86 percent of Brazilians claim that “traditional political parties do not care about people like [them]” and 89 percent favor a leader who will break the rules. Bolsonaro fits both of those qualifications. Reminiscent of Philippine President Rodrigo Duterte, Bolsonaro has favored extremist religious policies including the beating of gay children, as well as offering police the ability to shoot criminals without due process. He currently polls second among Brazilians, at about 21-25 percent. This is a sizeable margin above the governor Ciro Gomes, who himself occasionally sounds like a populist. He polls as 9-11 percent. The only person who has a higher approval by the Brazilian public is the imprisoned former President Luiz Inacio Lula da Silva, who is currently unable to run due to Brazil’s “Blank Slate” law, which prohibits criminals from running for office for eight years after their conviction. Bolsonaro poses a threat to Brazilian democracy but may be what the people want. A common rallying cry in protests was the institution of military rule. Bolsonaro supported the protests, but did not explicitly call for the implementation of martial law. In many ways, however, totalitarian leaders such as Duterte have acted as a one-man military force, and Bolsonaro may appease Brazilians’ need for a strongman. Similar to America post-Trump, Bolsonaro may weaken Brazil’s standing in the global order. Bolsonaro may jilt potential investors, offer a poor counterpart to reasonable-minded leaders, and could cause a nation on the brink to slip into chaos. It remains to be seen how the aftershocks of such protests may affect Bolsonaro’s standing politically and the outcomes of the Brazilian state. Next Opinion: The Trump-Kim Summit Sets a Dangerous Precedent. It was the Right Call Anyways.